Endive isn’t the most popular vegetable in the grocery store, but once you get acquainted with it, it’s actually a lot of fun and the scoop-shaped leaves make easy and versatile containers for all kinds of other stuff. Try it here as the base for bacon and tomatoes: it’s an easy adaptation of the classic BLT in easy, snack-sized servings. For the tomatoes, white wine vinegar and olive oil make a vinaigrette with a nice light flavor; it’s a little less in-your-face than balsamic vinegar but still vinegar-y enough to contrast with the bacon. This would make a tasty appetizer, and you could even add a vegan option very easily just by leaving the bacon off some of the endive leaves (everything else is totally vegan). But it would also work as a side dish, basically as a substitute for a tomato salad. Try it with burgers, fried eggs, or anything on the barbecue as an easy way to do something a little different. Lay the bacon on top of the parchment paper and bake in the oven for 15 to 20 minutes. Drain excess fat and, when cool enough to handle, break the bacon into crumbles. 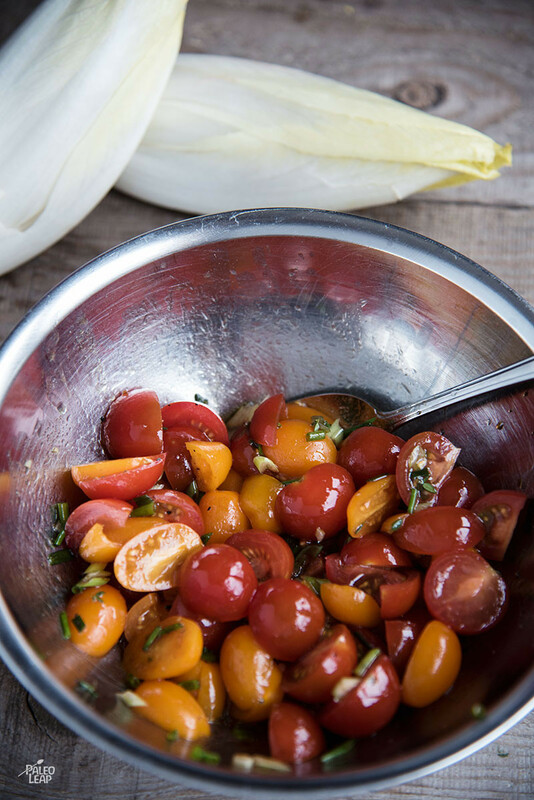 In a bowl, combine the tomatoes, chives, olive oil, vinegar, and season with salt and pepper to taste. Stuff the tomato-chive mixture into each endive leaf. 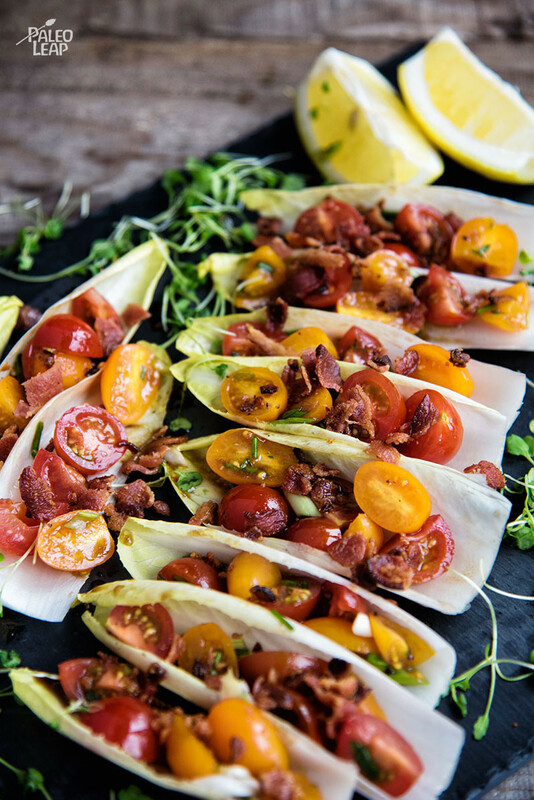 Sprinkle each stuffed endive leaf evenly with the crumbled bacon.